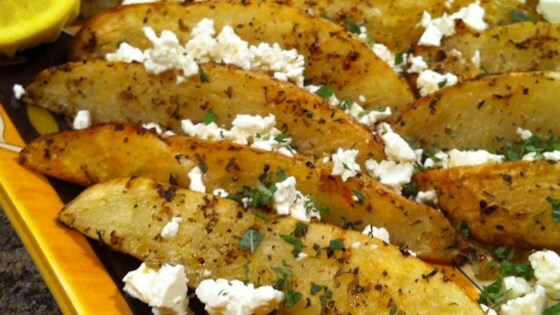 "I like these summery potato wedges with Greek flavor as a side dish for grilled lamb or kofta." Spread potatoes on a baking sheet; drizzle with olive oil and stir potatoes to coat. Stir Greek seasoning, lemon zest, salt, and pepper together in a small bowl; sprinkle seasoning mixture evenly over potatoes. Bake in the preheated oven until tender when pierced with a fork, about 20 minutes. Crumble feta cheese over potatoes; sprinkle with mint. Nice to have a new baked potato wedge dish. We enjoyed! Omg the smell was amazing and it tastes spataqular, I loved it.????? Delicious and everyone love it. Simple and tasty! I recommend broiling for a bit for some crunch!